For over 200 years The Royal Society for the Prevention of Cruelty to Animals (RSPCA) has been the leading UK animal welfare charity, saving and campaigning for animals in need. RSPCA has approximately 340 inspectors, 50 welfare officers and 88 animal collection officers working to prevent cruelty and promote kindness to animals in England and Wales. It’s our vision to work for a world in which all humans respect and live in harmony with all other members of the animal kingdom. We are best known for our rescue and rehoming work with cats and dogs, but we respond to all animals in need, not just pets but also wildlife, farm animals and laboratory animals. We rescue 114,584 animals on average every year and find new homes for more than 44,611 animals every year. We aim to improve the lives and reduce the suffering of farm animals by, aiming to have all UK farmed animals kept to RSPCA higher welfare standards, improving farm animal welfare legislation and ensuring it is enforced, encouraging consumers to replace meat, eggs and dairy products with those from higher welfare production systems, ensuring animal products are properly labelled so consumers can make higher welfare choices, and stopping the live export of farm animals for slaughter from the UK. We aim to improve the welfare of wild animals by stopping the use of wild animals in circuses, making it socially unacceptable to hunt and kill any wild animals in the name of sport, ensuring any use of performing animals in the UK follows appropriate guidelines, stopping the keeping of exotic animals as pets in unsuitable conditions, and stopping the ivory trade. 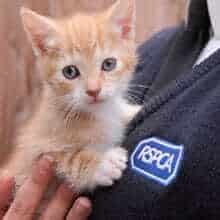 Giveacar and its donors are proud supporters of RSPCA as they work hard at saving animals all over England and Wales. If you’re planning to scrap or sell your car, give a car instead to help save an animal’s life. Your donation can help prevent animal cruelty across England and Wales. Do a good deed and help RSPCA when you donate your car to charity. The Giveacar scheme has helped the RSPCA raise over £25,000 from car donations, which is a fantastic amount. These donations are vital in helping us to continue our life changing work rescuing, rehabilitating and rehoming the animals in our care. We really appreciate the support and look forward to a continued relationship. Thank you so much.